In answer to the first response, I simply point out that, in fact, you can hold a group responsible, to some extent, for the actions its forbears committed. The Truth and Reconciliation Commission of Canada, for example, is based on that premise. This does not mean that someone (like me) who had no hand in founding, running, or promoting residential schools should have to take personal responsibility for the terrible destruction those schools inflicted on generations. But it does mean that I have a moral and indeed spiritual obligation to acknowledge the real and atrocious harm that was done by the same larger tradition that also raised me, to acknowledge that the harmful effects of that legacy continue today, and, to the best of my ability, move to correct the injustice that became part of the fabric of the tradition that clothed me. The phrase “members of the Body of Christ” brings us to the second response, the one that says that the Christian tradition can no longer be trusted to stand for justice. The issue of residential schools is just one example that illustrates the importance of the question—how can an organization with a significantly violent history (whatever its teachings have said to the contrary) credibly make calls to end violence, or eliminate poverty, or stop oppression? While interpreting Biblical texts is a notoriously fraught endeavor, I think it is relatively uncontroversial to say that the Bible teaches that the “body of Christ”—traditionally understood as the Church—is a unity. Different parts, one body. I would even wager that this “one body” stretches not only across geographical space, but also time. 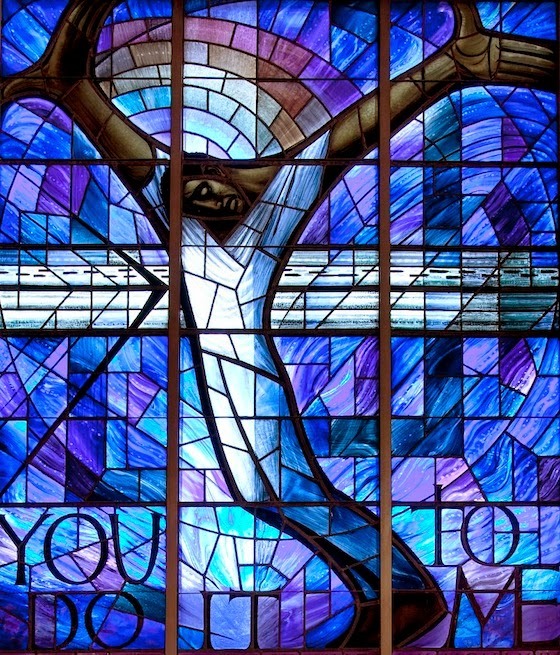 The body of Christ today is linked, in some ways, with the body of Christ during Bonhoeffer’s time, and Queen Elizabeth the First’s time; Augustine’s time, and Paul’s time. It is made up of Mother Theresas and members of the Spanish Inquisition; Harriet Beecher Stowes who worked to end slavery and Joan of Arcs who (however amazing in other ways) would have undertaken to physically eradicate those with different religious beliefs. Within the body of Christ there are heroes and villains and also frightened or conflicted people who just aren’t sure how to act. Some of the members have been all three of those things at once. Many members of the body of Christ have just wanted to live their life and tend their hearth, and leave questions of justice to other people. In other words, the body of Christ is made up of people, pure and simple. But... if Christ’s body is one body, then it includes people like you and me. It includes people like the stakeholder who asked the question that inspired this post. It includes countless individuals and groups who have worked for justice, who have worked for peace, who have put their lives and livelihoods on the line to fight oppression, harbor refugees, and care for society’s most vulnerable—sometimes in direct opposition to the ruling policies of their Christian brothers and sisters. And they have done so because they believed that is what Christ wants them to do. In working on this research project, not only have I been reminded of the Church’s complicity in and responsibility for a history of injustice, I have also been reminded of all the ways that same body, with different parts and in different ways, has worked to be the hands and feet of the Christ who said that whatever you do to the least of these, you do to me. For those who name themselves part of the body of Christ, the choice of what one does to “the least of these”—and really, that includes most of us in different ways at different times—remains continuously present. That’s how to respond to our stakeholder’s question: own up to all the harm, and good, that this body has done, and show Christ’s body working for justice today. Respond to the question by embodying justice. That’s one thing that the majority of the people we surveyed agree on: being a Christian means you are called to do justice. It’s a hazard—or joy, and sometimes both at once—of being a follower of Christ. After all, Jesus could be said to be many things, but apathetic was never one of them. Thank you to our stakeholders for asking us questions like these. And thank you to all those over the years who have given the body of Christ a concrete history of love and working for justice that it can both embody and draw upon. 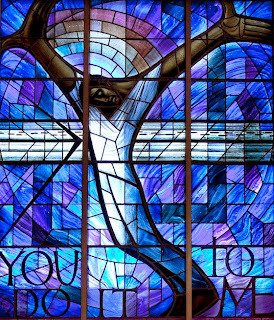 Photo: Stained glass window, Sixteenth Street Baptist Church, Birmingham, Alabama. "You Do it To Me." Thank you for this very thoughtful post. Its overall thrust is something I find myself at one with. The dichotomy it lays out is one I also puzzle over. The frame of thought of each response is the inverse of the other, but both use metanymy as the crucial move to get as it were from the complex and ambivalent concrete of Christian history to the identity of a gist of that history that has the unity and univocity to bear a simple judgment. For the apologist, one must distinguish between the actions of individual Christians and the intent of the Gospel. That intent, embedded in the stories of Scripture, particularly those surrounding Jesus of Nazareth, are confirmed by the myriad instances of Christ-followers who have done likewise. This is the church in the world. Whenever a Christ-follower acts differently in a manner inconsistent with that gist, that is not an act of the Body of Christ but a deviation and perversion. Christ-likeness in the concrete then stands for the entire Body of Christ in all its concreteness; the Body of Christ then acts justly and is a force for justice in the world throughout its history. The opposite judgment involves an opposite metanymy. Yes, there are Christ followers who have acted for justice, but there are many who have not (with the standard for what justice is in a given situation always the standard of the judge and of her or his time and place). Since, the church has been a very powerful "secular" force for much of its history, and that history has been marked by countless injustices both structural and personal, the church bears responsibility for them. It had the power to resist and not only did not but often was the institutional instrument by which the conditions for such injustice was woven into the social tapestry. As a result, injustice marks the concrete historical meaning of the church in a way that the individual and communal acts of justice of its members does not. The gist of its being in history is as a force and structure of injustice etc. What I hear you advocating in this post is to foreswear this use of metanymy in our thinking about the Body of Christ in the world through time. I hear you advocating that we all, apologists and critics alike allow the full ambivalence of concrete deeds and structures in time stand without attempting to boil it down to one simple gist that can then be judged. Apologists must acknowledge the harm that has been done in the name of Christ and critics must acknowledge the good. Both would be wise to foster the good and condemn or repent of the harm. Metanoia, the capacity for repentance, an ethos of repentance, the humility that allows one to embrace the need for repentance--to me this is one of the great gifts of our God to the human community given in and through the stories and person of Jesus of Nazareth. I say that as an apologist who would be equally cognizant of and horrified by the harm that has been done in the name of Christ.